Do you know the Japanese sweet castella? 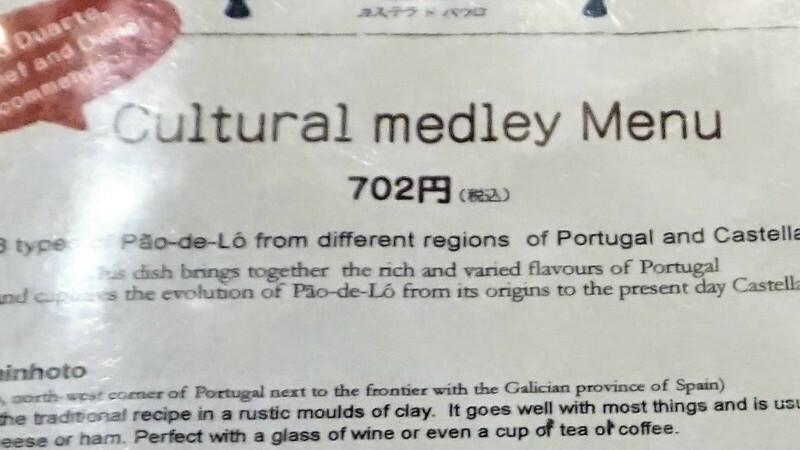 It’s a sweet whose name sounds Portuguese, and it’s, in fact, something that Portuguese missionaries brought to Japan. But this happened hundreds of years ago, so the present Japanese castella is not quite like the sweets that you can find in Portugal. This is where Paulo Duarte comes into the picture. He is a Portuguese pastry chef who trained in Nagasaki, then opened a pastry shop specializing in castella in the original home of the sweet, Portugal. But after this, he decided to head back to Japan, to the historic ancient capital city of Kyoto. Many Japanese shrines are known for the sweets that are sold close to them. Right now, Kitano Tenmangu Shrine is famous for its Chogoro-mochi, which was the favored by the famous daimyo Toyotomi Hideyoshi. So maybe in a few hundred years, Kitano Tenmangu Shrine will instead be known for its castella? This set of three types of Pao-de-lo and one piece of Japanese castella lets you taste the taste trip through the long history of castella, from its Portuguese origins to its present Japanese taste. To describe the difference between these offerings shortly, the Portuguese varieties are creamier than the Japanese castella, but the Japanese castella has a more refined taste. This set of a Portuguese egg pastry and café latte in Portuguese style is something that packs a lot of punch. The tastes are very strong, so you don’t need to eat a lot to be left satisfied. This pudding uses egg yolks and an ample amount of sugar to make it a thick, sweet, and soft dessert you shouldn’t miss at Castella do Paulo. You can also buy things to go at Castella do Paulo! They have all kinds of things on sale, like premium quality castella, egg tarts, and pudin de gema. Remember to enjoy the different tastes of Portuguese Pao-de-Lo and Japanese castella! I love both the flea market at Kitano Tenmangu Shrine, and this little piece of Portugal in the middle of Kyoto, Castella do Paulo. Their sweets are not light, nor are they health-conscious: what’s important here is the taste. The feeling of satisfaction you have after eating the sweets here is something special; something you will want to feel again. From Kyoto Station, take either Kyoto City Bus #50 or #101 and get off at Kitano Tenmangu bus stop. Castella do Paulo is on the east side of the shrine. Wednesdays and on the third Thursday of the month. Open on Wednesdays if 25th, the day of the big Kitano Tenmangu Shrine flea market, is a Wednesday. In this case, Castella do Paulo is closed on the following Thursday instead. Try to taste as many types of sweets here as you can; they’re all delicious. The place is run by a Portuguese pastry chef so they're exceptionally tourist-friendly! Japanese, English, Portuguese, Spanish, and French. They can ship some of their products domestically; check their online shop for more details.